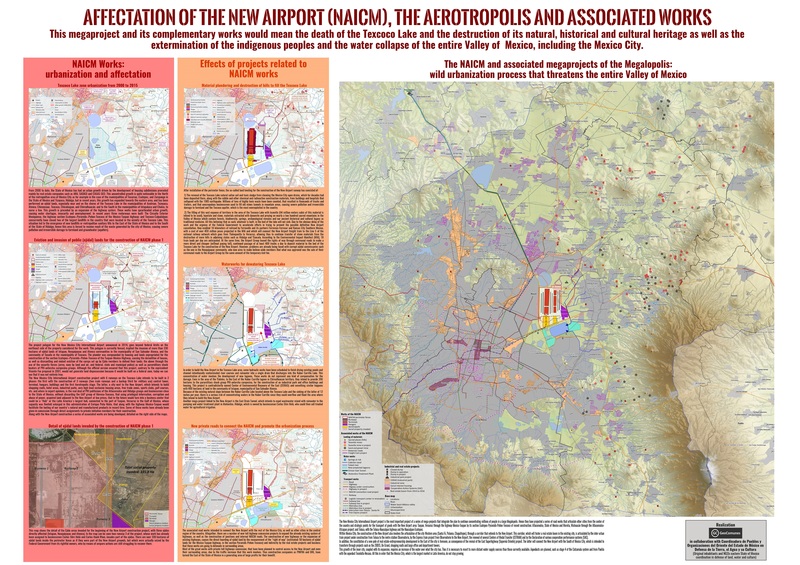 GAAM is delighted to share an incredibly informative set of maps elucidating the complex socio-economic and environmental impacts of construction of New Mexico City International Airport (NAICM). The maps were produced by GeoComunes, a collective working with communities to use maps as an analytical tool to strengthen the struggle for defence of common goods, in collaboration with affected residents and NGOs supported by Coordinadora de Pueblos y Organizaciones del Oriente del Estado de México (CPOOEM), which supports people’s defence of land, water and culture in eastern Mexico. The NAICM site, covering over 4,431 hectares, is the waterlogged Texcoco lakebed. Aerotropolis development is planned: a specific area within the airport site and commercial and industrial development over an extensive area surrounding it. 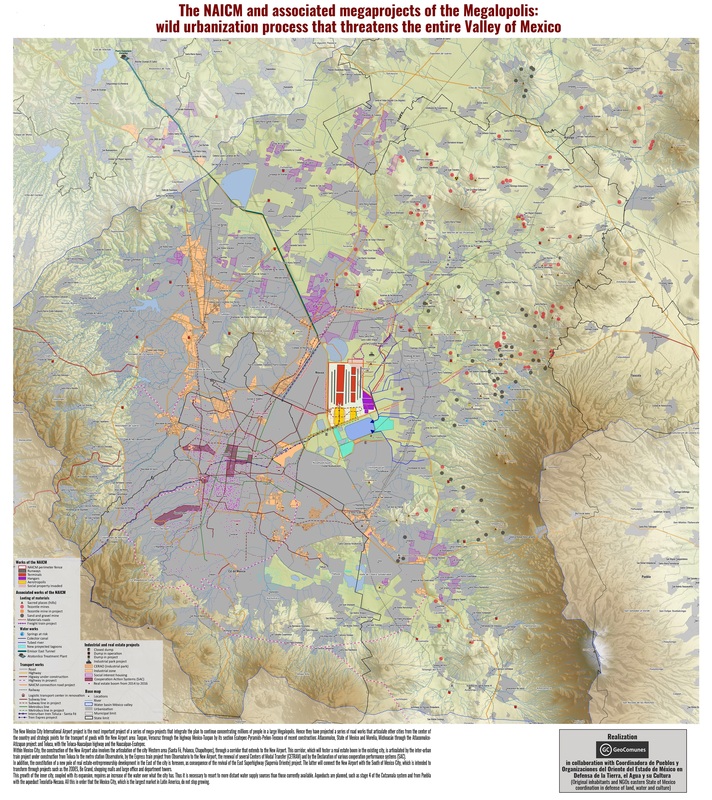 The first map, below, shows uncontrolled urbanization between 2000 and 2015, preceded by highway expansion, driven by real estate and encroaching on ejidos (communally held agricultural land) near the shores of Texcoco Lake. Landfill sites receiving waste from Mexico City have damaged farmland and polluted aquifers. The airport site is in the ‘Zona Federal’ area in the centre of the map. The existing Mexico City International Airport (officially named Benito Juárez International Airport) is shown near the bottom of the map. A perimeter fence has been erected around the NAICM Phase 1 project area. The site includes ejidal lands, in spite of assurances that the airport would be built entirely on federally-owned land. Ejidal lands were also appropriated for a highway and housing developments, and many Ejidos (land holders) were violently evicted by state security forces. Plans for Aerotropolis phase 1 include a shopping mall, hotels, industrial park, exclusive high-end housing, golf courses and a free trade zone. 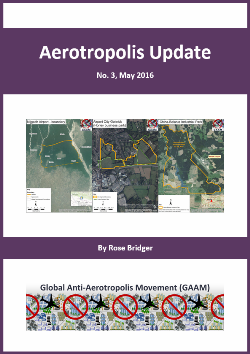 The third map shows satellite imagery of the three Ejido areas directly affected by airport construction. Over 330 hectares of ejidal lands, in the communities of Ixtapan, Nexquipayac and Atenco, were seized from its rightful owners by the government and now lie within the NAICM perimeter fence. Land-levelling to prepare the site for construction of the airport involved clearing saline sludge from the lakebed and toxic waste that has been dumped, polluting the Texcoco aquifer and damaging farmland. Extraction of materials for use in has had a devastating impact on sacred mountains, in the Valley of Mexico. Blasting with dynamite has damaged, forests, biodiversity, springs and archaeological remains. It is estimated that 64 million tonnes of tezontle (red volcanic rock) along with stone and other materials, carried on 400 trucks per day, will be deposited to fill in the Texcoco lakebed. Water drained from the Lake Texcoco area will be channelled into Nabo Carrillo, an artificial lake and newly created lagoons, along with water from the area east of the airport site channelled via several culverted rivers. Lying at the bottom of a downward slope the airport site is at risk of flooding from concentration of water flow in this area. The flood risk could become more severe as Texcoco lakebed is sinking at a rate of about 12 inches annually. An extensive road network linking NAICM to key urban centres is planned and under construction, encroaching on ejidal land and opening up additional land for real estate and commercial development. Many of the roads are toll roads which will generate profits for construction firms holding the concessions and thus set to benefit from the traffic flow. Data from all the maps is combined in the final map, which covers a wider geographical area revealing the extent of the urbanization that is underway and planned. See the larger version of the map for more detail. NAICM is shown within a wider context as the most important of, and the focal point for, a series of megaprojects combining to form a ‘Megalopolis’, an agglomeration of cities and other urban areas. New road and rail corridors will foster further real estate development. Mexico City already suffers chronic water shortages and springs and groundwater are over-exploited. The current model of urbanization will increase stress on water supplies and aqueducts are planned to access more distant sources. All the maps of NAICM and aerotropolis plans can be seen here in their entirety and are best viewed on the largest computer screen that you can find so you can zoom in and see the intricate detail.